Triang TT BR 0-6-0 Class 3F Locomotive Late Lined version, boxed. No 4171. CO-CO DIESEL LOCO, GOOD AND LIGHTED. BABY DELTIC CLASS 23 EE TYPE. TT / 3MM SCALE. Paint is removeable, collection sold as seen. Tri-ang TT Compatible GWR coaches x 2.Unboxed. Triang TT Compatible GWR coaches. One is a kit built syphon, the other amodded Triang to resemble a Collett coach.Good used condition. BR CLASS 15 D8200 BTH/PAXMAN. TT / 3MM SCALE. Tri-ang TT Type A track selection x 12 unboxed. In good unboxed condition. All fish plates intact. LMS 10000 PIONEER 1600 HP DIESEL. TT / 3MM SCALE. Tender has had 'Great Western' transfers applied. In otherwise very good condition. Tri-ang TT compatible Gem signals unboxed. Tri-ang TT compatible BEC J 50 unboxed. Triang TT BEC LNER J50, solder construction, air brush finish, smooth runner.Unboxed. One in reddish brown the other in dark brown with rubbed transfers. otherwise both in excellent condition. I have used my server for many years and there has never been a security problem as I only host pictures. Tri-ang TT T4 Trainset boxed. Tri-ang TT T 272 bogie ICI tanker boxed. Triang TT T 272 ICI red bogie tanker in superb boxed condition. Here we have two GEM TT King loco bodies with Tri-ang tenders. Note these are not in a very good condition but could well be made up into nice models. TT 3mm SCALE 12mm GAUGE. WAGON AND COACH IN GOOD USED CONDITION, THE COACH IS MISSING THE TWO ROOF RAILS. Tri-ang TT T 135 SR green Utility van unboxed. Triang TT T 135 SR green utility van in good used condition.Unboxed. They are all slightly grubby and will need a clean. Cattle dock is in excellent almost unused condition. Excellent condition with excellent box although has T171 Grain wagon hand written on one end. 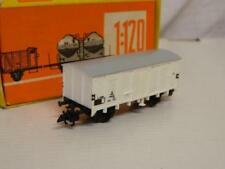 Triang TT Three boxed tank wagons, comprising T73,T75,T76, All in excellent boxed condition. Excellent box and with an excellent signal box as well. Tri-ang TT T 151 Type B straight track x 8 unboxed. Tri-ang TT T 161 RH type B points x 2 unboxed. Triang TT T 161 RH x 2 points in good unboxed condition.All fishplates intact. This is an unboxed Prairie Tank loco in BR green. The loco hasn't been run for many years, so may benefit from a light service / lubrication. Triang TT Type A points x 2 unboxed. Triang TT Type A RH points x 2 in good unboxed condition. TT gauge Kit built wagons etc, please read description. Buffers & couplings intact, removable real mineral load. Unbuilt LNER/BR 13 ton High Goods wagon body kit. CONTAINS WHEELS< BEARINGS & BODY ONLY - NO CHASSIS! BR CLASS 14 D9500 `Teddy Bear`. TT / 3MM SCALE. TT / 3MM SCALE. BR HST POWER CARS ( PAIR ). Tri-ang TT T 97S Boadicea and tender, unboxed. Triang TT T 97S Boadicea and tender in excellent unboxed condition. New numbers and linings on cab and tender,super working smoke unit, smooth runner,getting harder to find. Tillig TT gauge EW3 right hand point 12 degree - item number 83341. Bought over 12 years ago and has been in dry storage since, there may be the odd storage mark on the box, but the item is unused. Bargain price - don't miss your chance! Triang TT Gauge T90 "Jinty" Tank Loco with new smoke unit Excellent Condition . This is the later and rarer version of the Triang TT Jinty Tank 0-6-0. This is a nice (unboxed) example with near perfect numbering lining and decals.No damage, good coupling hooks, runs extremely smoothly and quietly in both directions. Has been fitted with a brand new Seuthe smoke unit (worth £26) which works well. Oiled up and ready to go! Rosebud Kitmaster maroon open W24719. Tri-ang TT gauge maroon composite W15732. Blood and custard on other side. No windows. Broken coupling at one end. No couplings. 5 x T176 12ton open wagons. BR Brake van, repainted roof. Whenever possible this should be done in a pillar drill, before assembly of the baseboards. To ensure that the dowels are fitted securely into the baseboards the holes should be slightly undersized. Rosebud Kitmaster maroon open M15243. No bogies or couplings. Rosebud Kitmaster maroon open M24133. Rosebud Kitmaster maroon open no number. Rosebud Kitmaster maroon brake. No number. No bogie or coupling at one end. TRIANG TT GAUGE BR COACH 53171 Condition is Used. Dispatched with Royal Mail 2nd Class. Please see my other listings. Can combine postage on request. Auhagen TT/ 1: 120 - 13 299 Railway Station Klasdorf part built Used boxed. Boxed in very good condition. Tri-ang TT gauge Pullman Car "Eagle". Tri-ang TT gauge maroon baggage car S224S. Tri-ang TT gauge green open carriage. No number. Tri-ang TT gauge green brake. It runs well but obviously will benefit from a service. Like all the other locos from the original owner the body has not had a screw hole made therefore the body is loose on the chassis, also the rear lugs have also been filed off.